For those who missed Charles Perry’s cooking demos at the Abu Dhabi International Book Fair last week, we’re including here two vegetable recipes he prepared for audience members—both of them taken from Scents and Flavors, but with modern cooking instructions for making these at home. I can confirm that both are delicious! This festive recipe calls for a bit of rue, an herb with a plum-like aroma and a proverbially bitter flavor, which medieval cooks often added as an accent. It can easily be omitted. The browned onions add a sweet note to play off the vinegar dressing. Cut the carrots into disks and boil them just until done. Drain and put in a mixing bowl. Slice the onion, separate into rings and fry until brown, stirring constantly, about 20 minutes. 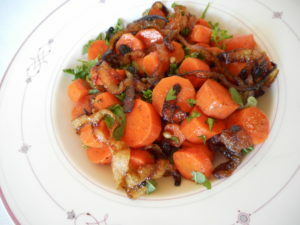 Mix the carrots with the parsley, mint, rue, coriander, cinnamon, clove and pepper. Stir the vinegar and honey together and toss the carrots with it. Transfer to a serving dish and garnish with the browned onion. This can be considered an exotic cousin of hummus, made with cowpeas (also known as black-eyed peas) rather than chickpeas. Walnut and caraway compliment the unique sweet vegetable-like aroma of cowpeas remarkably well. Pick over the cowpeas to remove any extraneous matter. Cover with boiling water and cook for 2 minutes, then remove from heat, cover and let sit for one hour. Strain off the liquid. Add 6 cups water, 1 teaspoon salt, and boil until done, 1 to 1-½ hours. Reserve the cooking liquid. 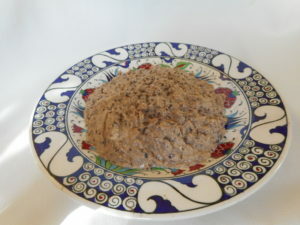 Puree the walnuts until you can see a layer of walnut oil appear at the bottom of the food processor. Put the oil into a frying pan, add the walnut paste and cook over medium heat until the raw walnut smell goes away, about 4 minutes. And the caraway and coriander seeds and stir the paste with the cowpeas. Add a few tablespoons of the reserved cooking liquid to give a smoother texture. Taste and add more salt if desired.